Wine Tours have become increasingly popular over the past decade. In fact, a term was defined for such an exploration: Enotourism, which is tourism with the purpose of tasting, consuming, or purchasing of wine, often at or near the source. 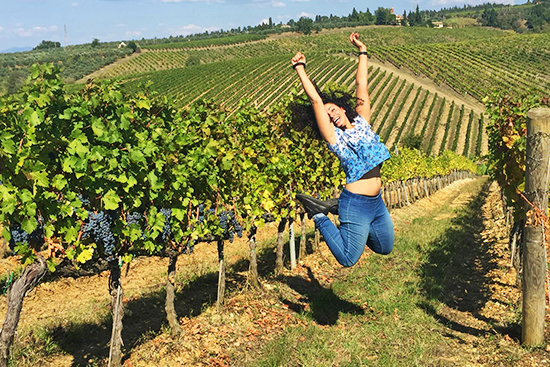 Enotourism often consists of visiting wineries, tasting wines, walking in the vineyard, or even taking part in the harvest and crushing grapes. More importantly, wine tasting had long been reserved for enthusiasts only, evolved into a special occasion activity (think birthdays or bachelor(ette) parties), and now are accessible to anyone in a wine-producing region. With expansive acres of vines on mineral-rich soil, coastal climate, and eager vintners, there are hundreds of unique wineries on the Central Coast with more popping up each year. From Edna Valley to Paso Robles, wine enthusiasts and lovers unite to explore each region and taste varieties of Pinot, Merlot, Chardonnay, and more. Getting a group of friends together to see, smell, and taste what each room has to offer is an ideal way to spend an afternoon, but there are many moving parts. Who’s driving? What to eat? Where to go? With so many great options, it’s easy to get overwhelmed when planning an outing—but don’t you worry, we have a plan that anyone can follow without breaking the bank! 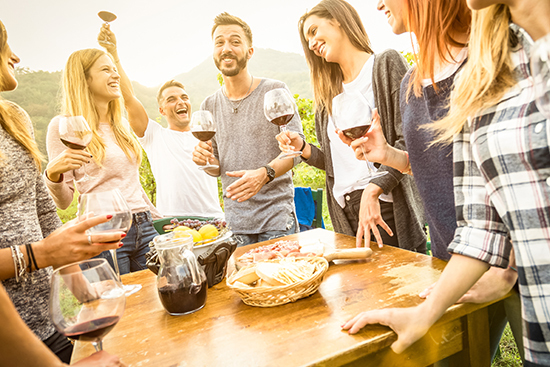 Weekday Warrior – There are multiple reasons to book a weekday wine tour, but the most important is the discount you receive for tasting during the week. This is the most efficient way to save big bucks on a wine tour. Transportation fees are lower, tasting fees are often waived, and there will not be a wait for service. This is especially important for those who want to be educated by the great staff at select wineries. Work a 9-5? No problem! Consider taking your company on a corporate wine tour for beneficial team bonding time and a break from the office space. 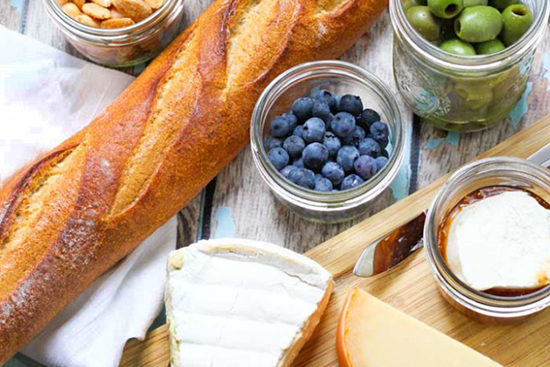 Salami, cheese, and fruit packs— use local vendors, too! Alle Pia can provide you with fine cured meats, Central Coast Creamery’s Holey Cow or Bishops’ peak pair well with everything, and if you’re lucky enough to get your hands on some Talley Farms produce, you have a winning trio! Protein-packed salads: Cut up everything up that we just listed, throw it in a bowl, dress it, and that’s how salad works. We think. Alternatively, you could go a lighter route with a spinach, feta, cranberry, and walnut salad with vinaigrette dressing. BBQ—The Central Coast is known for its Santa Maria-Style barbecue, and if you have time to whip up some chicken, tri-tip, or ribs before heading out, you’re going to feel like a champ. If you don’t, we’re going to cheat a little and let a restaurant onto the list, as we love the food that Old SLO BBQ offers for cheap. Buy Bottles—One of the best parts about spending a day out in the vines is bringing some of the product home. Additionally, while this seems counter-intuitive to saving money, tasting rooms actually often wave tasting fees if you purchase bottles. Check our friends Malene in Edna Valley or Opolo in Paso Robles (and many others that we love) to take advantage of this perk! Once you have a plan in mind, there are a few ways to book a wine tour. You can create a full itinerary, pay-per-taste, bring the food, and keep complete control of the afternoon. Alternatively, if all the information is too much, both SLO Safe Ride and Obsidian Luxury Services can fully customize your wine tasting itinerary to ensure satisfaction. In any case, we encourage you to go out there, seize the (week)day, and eno-tour your way through an afternoon on the Central Coast! Contact SLO Safe Ride at slosaferide@gmail.com or by phone at (805) 620-7233.